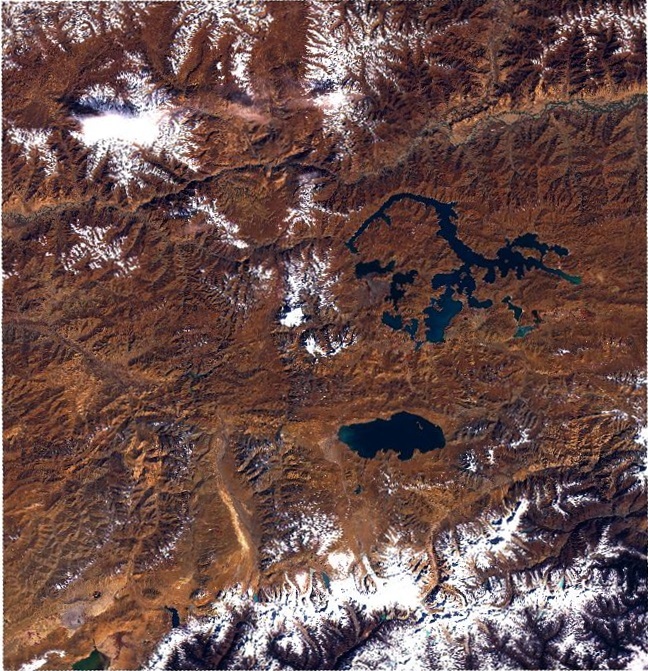 Southern part of the Qinghai–Tibet Plateau, showing the Puma Yumco and Yamzho Yumco lakes. Image acquired by Landsat-8 on 23rd November 2013. Data courtesy of NASA/USGS. Two interesting, and indirectly linked, articles were published in the last few weeks looking at how satellite imagery and remote sensing techniques are being used to monitor changes in glaciers across the globe. Firstly, the paper ‘Global Assessment of Supraglacial Debris‐Cover Extents’ by Scherler et al was published last month in Geophysical Research Letters. The team from German and Switzerland used satellite images to automatically detect the amount of debris, such as rocks, sediments, etc., on glaciers. It’s reported this information has been recorded rarely to date, but it is critical. The speed of glacier melt can be influenced by the amount and size of debris on glaciers, and obviously there is the continual exposure of new debris as the ice sheets covering it disappears. This study used images from Landsat-8 and Sentinel-2, and compared these to base images from the Randolph Glacier Inventory, a global inventory of glacier outlines. They studied a number of glaciers across the world, although the Greenland ice sheet and the Antarctic were not included, using a technique they developed to make pixel-by-pixel comparisons of the images. The outputs showed that approximately 4.4 percent of glacier surfaces are covered with rubble; however this varies with the region. Towards the poles the debris coverage decreases due to the flat land, when compared to high mountain glaciers. Interestingly, debris is higher on smaller glaciers than larger ones. It is hoped this study will help provide a better understanding of how debris affects glacier melt and influences the environment. This is critical as mountain glacier meltwater provides drinking water, irrigation, power generation and other uses to communities downstream. The potential impact of this was highlighted in warnings published by Chinese scientists who stated that the melting glaciers in the Qinghai-Tibet Plateau will cause issues with future water supplies. The plateau, sometimes referred to as the ‘Roof of the World’ or ‘The Third Pole’, covers an area of 2.5 million square kilometres and sits 4.8 km above sea level in the Himalayan mountains. It has tens of thousands of glaciers which hold the headwaters of Asia’s ten largest rivers, providing water for three billion people across Asia. 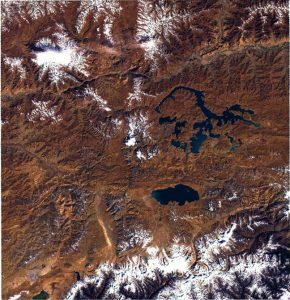 The image at the top shows the the kidney shaped lake Puma Yumco, just below centre, on the southern Tibetan Plateau. A research mission led by Yao Tandong, Director of the Institute of Tibetan Plateau Research with the Chinese Academy of Sciences, found that between 1960 and 2012 the temperature in the region rose by almost 0.4 degrees Celsius per decade and during this period the glaciers lost 15 percent of their mass. This increased the amount of water released and is reported as leading to glacial collapses and floods. Without action, the team estimate that within the next fifty years the smaller glaciers will disappear completely and the larger ones will shrink significantly. Sixteen Chinese research institutions launched a project last month to build an integrated observation network including polar-orbiting satellites, remote sensing aircraft and unmanned aerial vehicles to provide information to decision makers in order to protect the plateau’s environment. These are two interesting examples of how satellite remote sensing can be used to help us better understanding how the world is changing. This entry was posted in Data, Earth Observation, ESA, Landsat, NASA, Remote Sensing, Research, Satellite, Sentinel, Space Can Help, Space Industry and tagged Chinese Academy of Sciences, debris, Geophysical Research Letters Journal, Glacial melt, glacier, Landsat 8, melting, meltwater, polar-orbiting satellites, Qinghai-Tibet Plateau, Randolph Glacier Inventory, remote sensing, rocks, Roof of the World, satellite, Scherler et al, Sentinel-2, Third Pole, Tibetan Plateau Research, Yao Tandong by Andy. Bookmark the permalink.